Yes, summer has started at least our temperatures have reached summer levels. Today's temperatures climbed to around 90° (about 32 Celsius). We do not have central air in our house and unless it get's brutally hot and humid we like to rely on a fan in the bedroom. 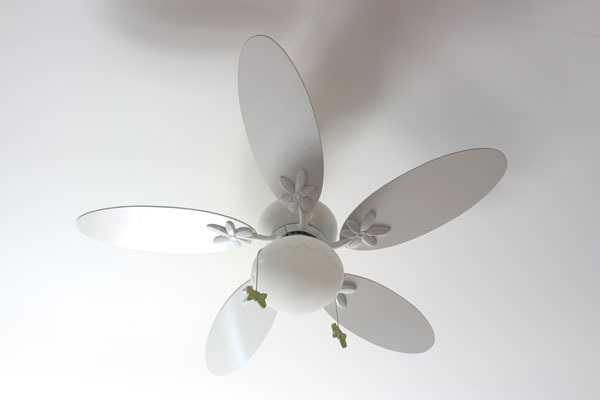 Unfortunately we don't have a ceiling fan in the bedroom but P's and my office does. When it gets unbearable we bring out the big gun our portable air conditioner, so far it wasn't needed. 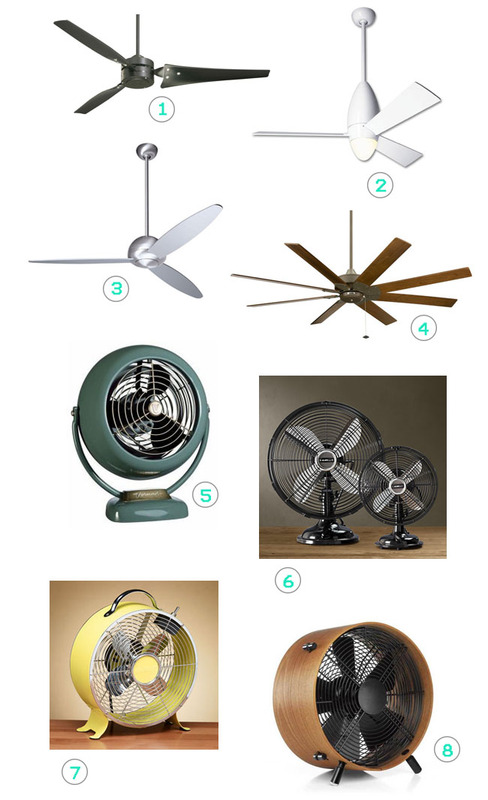 Here is a little selection of fans to keep you cool. Yes, it's Monday again but this time it doesn't mark the beginning of a new work week because we have a holiday today. The past week it has been raining on and off. At one point it made me feel gloomy but another day while walking home from the gym I enjoyed playing in the puddles of water. On the first pictures you can see the view I get when I'm sitting at my desk at the office. If the weather is nice I can see the Empire State Building right next to the highrise building but it sometimes disappears when it's raining, snowing or it's foggy. When I first started my job I needed to look at it every 5 minutes to remind myself that I am really working in New York. Because we are having a three day weekend over here I made a huge to-do list and so far I was only able to cross off one thing. Sigh... But today is another day and maybe I can cross off a thing or two. Maybe my to-do list was not really realistic anyways. You're probably wondering why I am posting on a Tuesday but I had to let you know that today my very first guest post is up on like/want/need where I'm sharing one of my greatest vacations with you. Erin is on her way back home after traveling through Europe for the past week and let a bunch of guest bloggers take over her blog to share their vacation stories. I have to admit it's kind of scary writing for somebody else. I had a big case of writer's block and turned in my post in at the last minute. 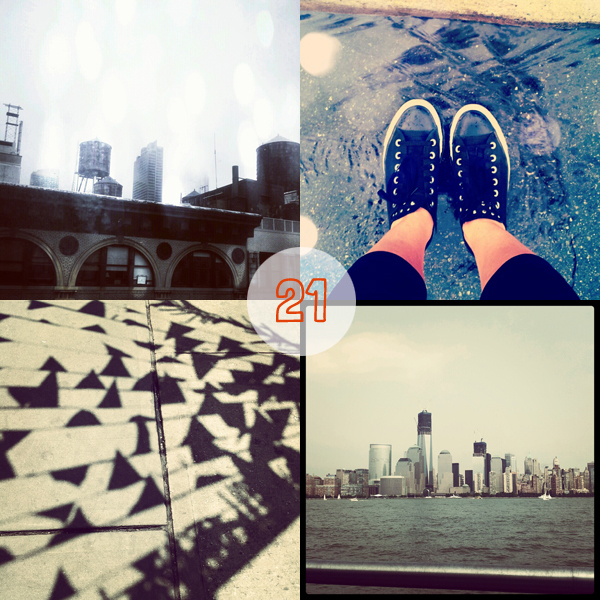 Last week felt so short again, I can't remember what I kept myself busy with but I felt pretty busy. I started a little freelance drafting job, my first one in years. Yay! 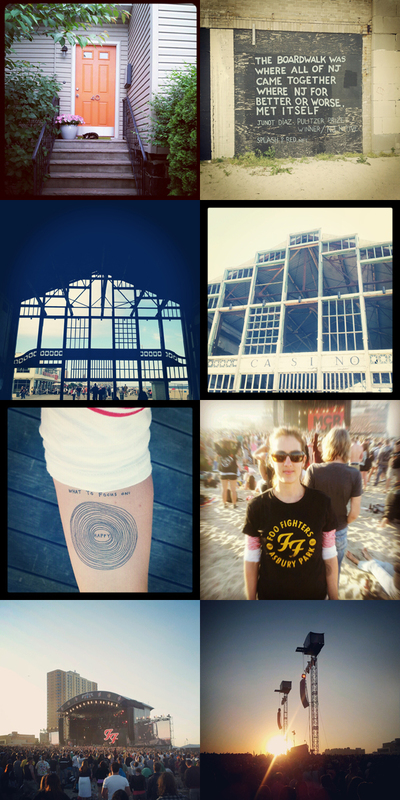 P and I spent the weekend at a friends place on the Jersey Shore and went to the Bamboozle Festival in Asbury Park both days. Saturday we had great weather and hanging out at the beach was a lot of fun. On Sunday we had a sunny morning but by the time we arrived at the festival grounds it had gotten cloudy and windy. I had to put on all my layers but was still cold, so I bought a hoodie for myself. There were lots of booths on the festival grounds that either sold band merchandise or clothes from small independent labels. The hoodie I got is from this label, unfortunately I couldn't find it on their website. It kept me warm and looks cute too! The temporary tattoo I got at the last Apartment therapy design Evening where Tina Roth Eisenberg (swiss miss) spoke and everybody got a little bag full of tattlys one of her latest endeavors. I chose this one because I want to focus more on being happy and not dwell on the things that drag me down..
After putting my flea market money into my secret stash I started thinking about what I could treat myself to again. Started the secret stash about three years back and since then nothing was good enough to justify spending that money. After my post about making money at the flea market Erin suggested buying an iPad but I already had ruled it out although it's still on the list of things that would be nice to have. Theresa hit a nerve when she suggested a nice piece of mid-century furniture. I remembered how much I love the bar cart that Niki from my scandinavian home owns so I started looking for one on Ebay and will also start looking for one in thrift stores. As somebody who loves wearing boots a pair of Frye boots have been on my wishlist forever but so far I could not bring myself to fork over more than $300 for a pair of boots. But on the other hand they will probably last a lifetime. Another expensive item on my list is a telephoto zoom lens which would be great for our upcoming vacation in Utah (hiking in Bryce Canyon). Or maybe a nice leather jacket? Crossed another small project off my list. Yay! And it didn't even take long to finish it. 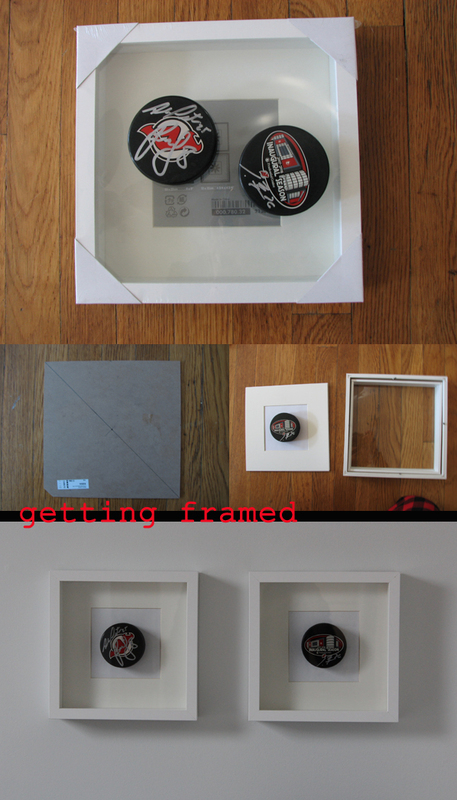 P had these two pucks he got a after NJ Devils hockey games that one of his coworkers had gotten signed by three Devils players. Two of them are still with the team and currently trying to beat the NY Rangers in the playoffs for the Stanley Cup. (Let's go Devils!) For those hockey fans among you the players that are still with the team are #8 Dainius Zubrus and #26 Patrik Elias. 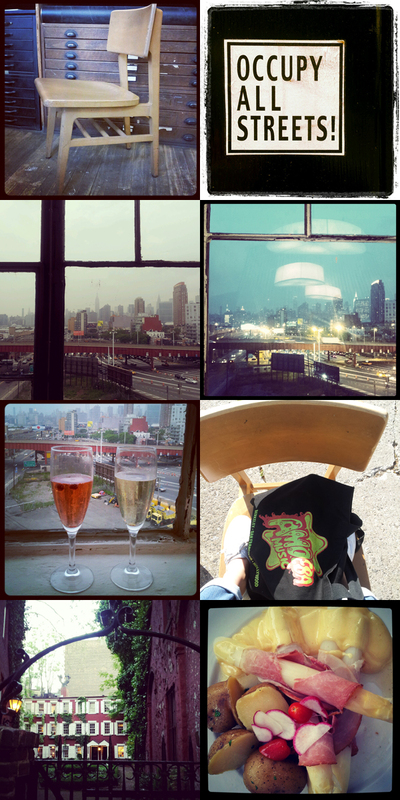 On Wednesday I went to an event in Long Island City, the venue had a great view of the NY skyline. They served prosecco mixed with Fragoli, a wild strawberry liqueur. So good! 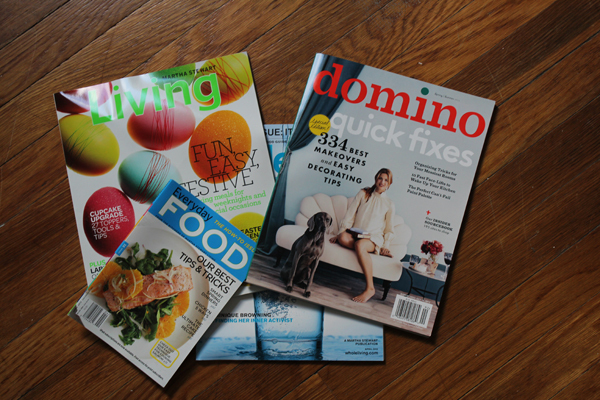 The Martha Steward magazines were in a little goodie bag that was handed out at the end of last month's apartment therapy design evening, which hosted Pilar Guzmán, the editor-in-chief of Martha Steward Living, hence the MS magazines. 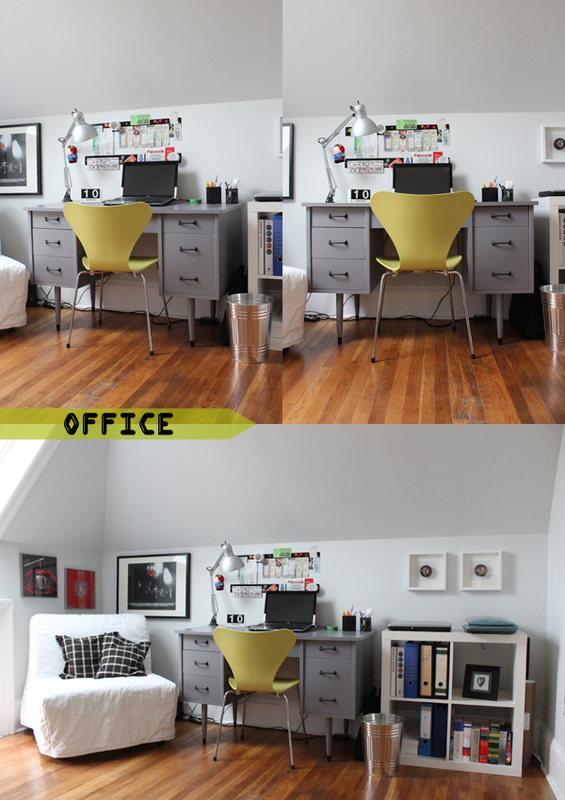 You can check out the interview over on apartment therapy. Remember when I spray painted my candelabra hot pink in February? If so you might also remember that I was already looking for something else that needed a neon makeover. 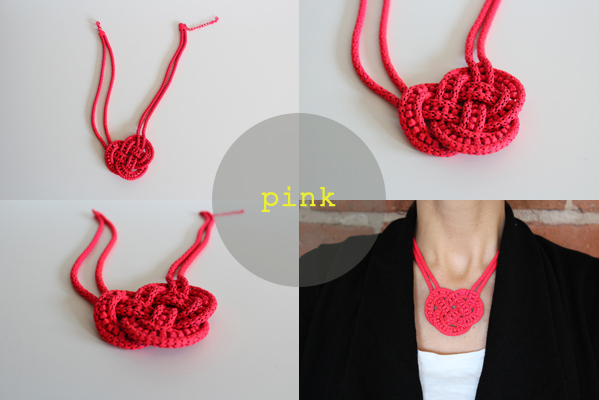 After seeing some cool neon necklaces while browsing the internet I thought I could make my own. I bought two necklaces on sale at a Burlington Coat Factory store near my office. 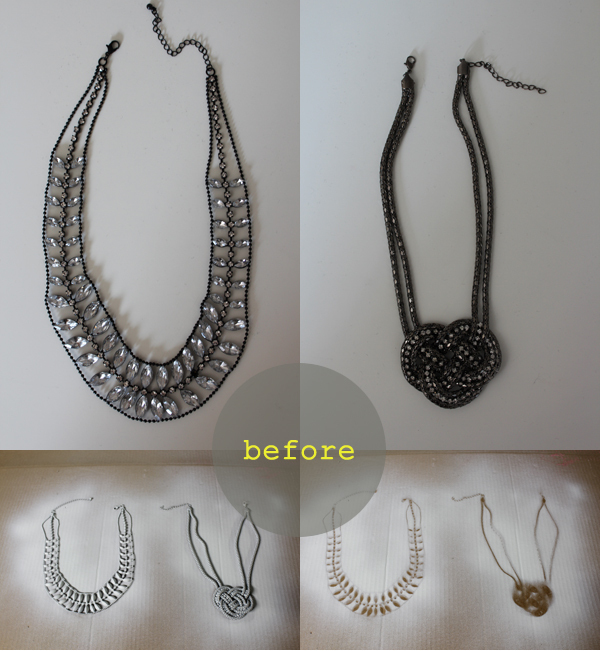 I liked the shapes and at $3 per necklace I could justify to give spray painting them a try. The supplies I had already at hand from previous painting sessions and I followed the same procedure as I did with the candelabra, just omitting the mistake with the dark primer and using white primer in the first place. 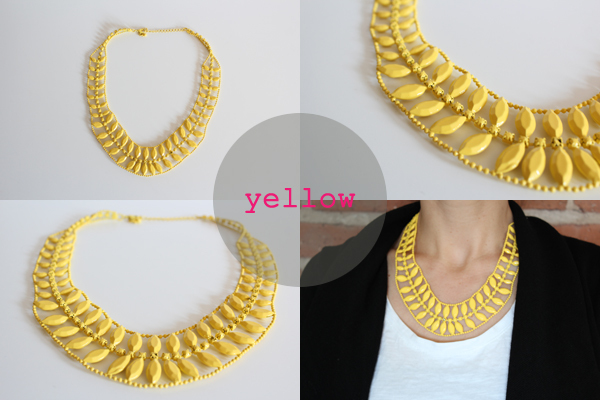 One necklace got a yellow makeover and the other one was transformed with fluorescent pink spray paint. I have to say both necklaces came out better than expected and really brighten up my wardrobe. What's your take on the neon trend? I already had a neon phase in the 80ies but feel it is different now. Back then I liked the combination of midriff baring and neon. I've already seen cropped shirts again in magazines but this will be a trend that will not make it back into my closet. I did it! The chair is finished, I am sitting on it and writing this post. It is so comfortable but I might be biased after fighting with it for nine rounds. I'm even jumping for joy :) Can you believe that in mid-February the chair still looked like this? Did you finish a project that made you really happy lately?